So much of the idea of signal and the definition of an audio “mixer” is fixed, we’ve begun to take these concepts for granted. Microphones plus line level, into some faders — that’s what a mixer is. But why does it have to be that way? By creating a new instrument around connecting to contact mics and electromagnetic pickups, and even making output to DC motors and solenoids, KOMA Elektronik leapt out of the mainstream – and turned the concept into a runaway hit. First full piece of music I made using the Koma Electronics Fieldkit. The kit mixes everything, controls the speed of the walkmen tape loop, plays radio, and uses the envelope from the radio as a rhythmic element. Just the Field Kit’s crowd funding success is itself some kind of news. I’m writing this footsteps from the Musikmesse trade fair, where so much of what manufacturers assume musicians want is rooted deeply in the past. And not that there’s anything wrong that – there’s something wonderful about wandering halls of pianos or accordions. And sure enough, technology followed suit – assuming musicians want to record those instruments via gear that works the way gear that does that always work. But it’s the flipside of this line of thinking – that anything outside that box, anything experimental and weird, would be therefore undesirable – that seems like something worth escaping. And escape KOMA’s Field Kit did. Largely by word of mouth, without any fancy PR effort, this idiosyncratic box for wiring in odd sounds and experimenting with them turned into €299,777 of its original €20,000 goal. That may not shake up the larger music gear industry, but it represents the votes of confidence of a community of people wanting to experiment with music. Now, those people are getting their kits. And if you weren’t in the camp that sent money in advance, you can now line up to buy one of the units that start shipping in May. But let’s back up — what is this thing, anyway? The Field Kit is described by KOMA as an “electro-acoustic workstation.” Think of it as a signal processor instrument, a very specific sort of mixer that adds special features for bringing in amplified and electromagnetic sounds from the outside world, mucking about with them (including adding an LFO and envelope follower), then outputting them – or driving motors and solenoids for some mechanical action along with your performance. There’s even a little AM/FM/SW radio tuner, which you can tune manually or tune via outboard analog CV signal. 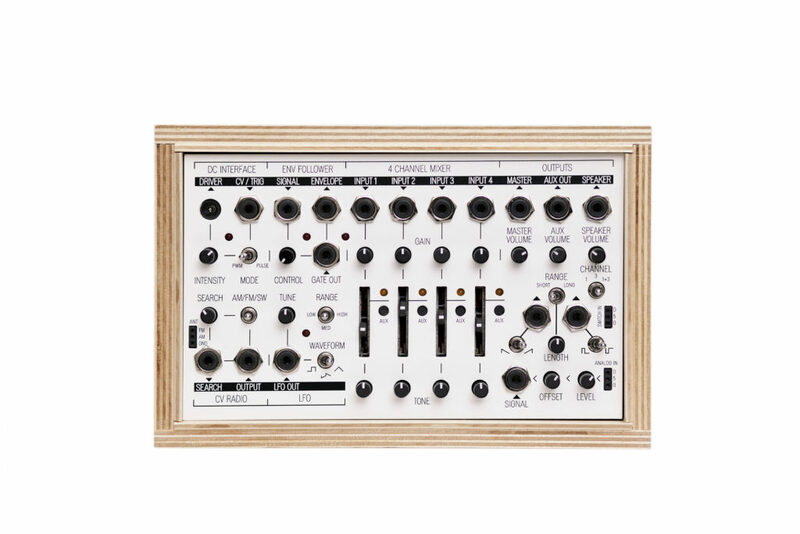 It also integrates with Eurorack/modular setups: it’s patchable with CV, and an option for mounting directly in Eurorack is available. As such, it’s really a desktop, integrated instrument that does a lot of the sorts of tasks that normally required some DIY electronics, for experimental performance and sound art and installation. If I’m describing this concept badly, someone definitely got it. 350 rewards have already shipped out, with another 750 of them on their way. There are going to be a lot of these in the world, and that itself is lovely. If you want one for yourself, it will run you €179.00 (assemble it yourself) or €229.00 (pre-assembled). Then you probably want the accessory kits, which get you up and running with some fun noise discovery tasks straight away. I think actually the “Expansion Pack” is terribly clever. 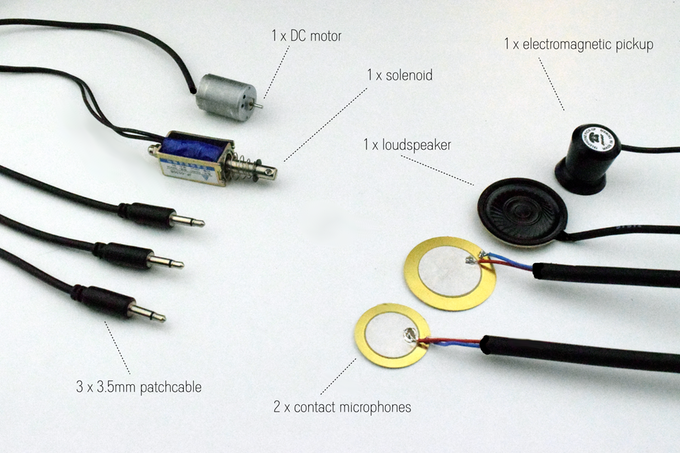 It comes with a speaker, contact mics, an electro-magnetic pickup, a little solenoid (for hitting stuff), a DC motor, a speaker, and patch cables. Plus, while half the fun is discovering objects to play, you’ll find springs, clamps, and the like in the bag. If you got one, and make something nice with it, do share with us!